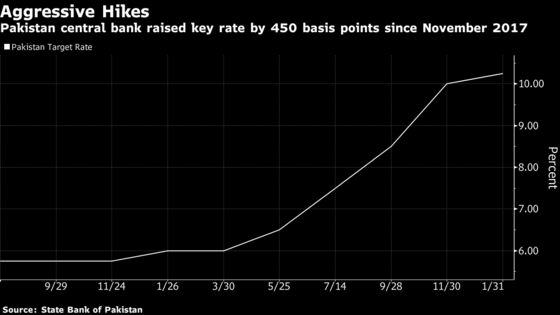 (Bloomberg) -- Pakistan’s central bank sees inflation behaving well in the next financial year beginning July, but will stand ready to use monetary policy tools after the most aggressive interest rate tightening in Asia last year, its governor said. Consumer price growth will be anchored by low food inflation, State Bank of Pakistan Governor Tariq Bajwa said in an interview. 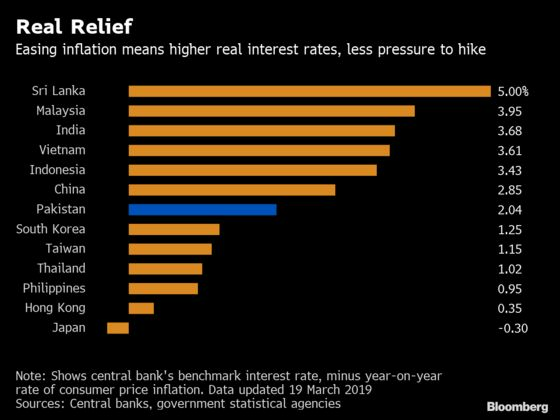 While inflation accelerated to 8.2 percent in February, the highest since 2014, the central bank doesn’t see average inflation for next year breaching double digits. The monetary policy tightening was also aimed at containing the financial blow outs from Pakistan’s twin current-account and budget deficits, which limited the nation’s ability to repay debt and pay for much-needed imports. Prime Minister Imran Khan’s government is in talks for a bailout package from the International Monetary Fund, in addition to securing soft loans from friendly nations to bridge the financing gap. The crisis has already caused economic growth to slow, while fanning inflation. The median forecast in a Bloomberg survey for inflation in Pakistan in the second quarter of 2019 is 7.8 percent, the highest in the Asia Pacific. The central bank has also removed permission to pay for some imports in advance and also restricted purchase of non-essential items. That’s helped narrow Pakistan’s trade balance to a 29-month low in February, according to Karachi-based brokerage Arif Habib Ltd.